In Lo de Marcos Mexico, just 11-km north of San Pancho (San Francisco), you can enjoy the essence of a true Mexican town. Wide, calm streets, colorful flowering trees, and brilliantly painted façades accompany patient fishermen as they weave their nets, which they will later throw into the warm Pacific Ocean located at the end of the paved walkway. “It is a small paradise on Earth,” expresses one of the inhabitants of this corner of the Riviera Nayarit. Here, resort hotels and villas of the purest Mexican style will welcome you with open arms. Lo de Marcos Mexico is a town with a remodeled gazebo in the downtown plus many small businesses and exceptional restaurants that serve up delicious homemade Mexican food and friendly service. 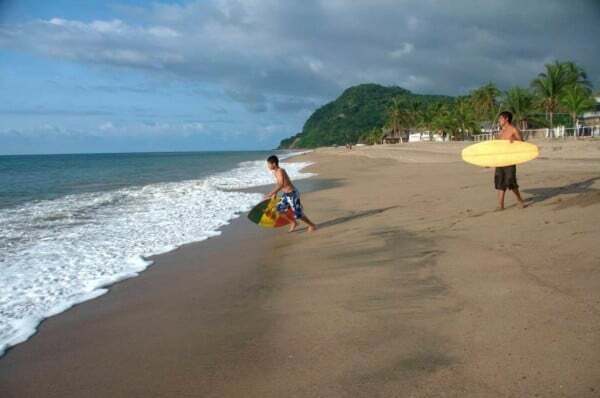 “The beaches are extremely calm; when the waves break you can even see the fish,” shares a woman who for years has visited Lo de Marcos Mexico where, she says, she has found a tranquil refuge. Bungalows, villas, comfortable hotel rooms and a well-equipped RV park are the lodging options available at this inviting retreat on the Mexican Pacific coastline. Its beaches, Los Venados, Las Minitas, El Atracadero, and Lo de Marcos, are surrounded by green hills and whimsical rocks that contrast beautifully with the intense blue sky and warm Pacific waters. This idyllic scene is completed by visitors that carry out various activities such as beach volleyball, jet-skiing, jumping in the calm waves with children, or even fishing off the shore. Savor some grilled fish in one of the thatched-roof huts found along the beaches of Lo de Marcos Mexico. Walk along the peaceful streets and enjoy the delights of the sea and sand, in an ambiance of complete tranquility.